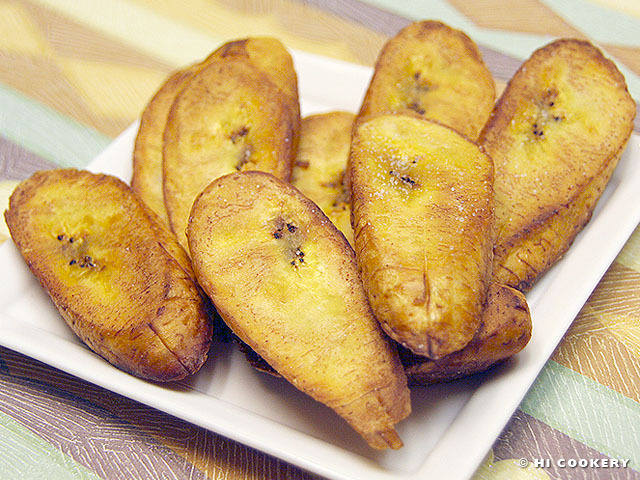 Fried bananas are a favorite for Islander. Her Mommy used make them as a sweet side dish to sinangag for our family for a Filipino-style morning meal. The type of banana she used was called Cardaba or Saba banana, also known as the Philippine plantain. After moving to the mainland from Hawaii, Islander had not eaten fried bananas for a long time until befriending classmates and co-workers from the Caribbean and Latin America. At get-togethers in their homes or restaurants, she ate maduros as an appetizer or dessert and sometimes substituted starchy potatoes for plátanos fritos or tostones. As we like to cook different cultural cuisine for our blog, we fried plantains to observe the International Banana Festival food holiday. Get a green plantain from the grocery store and let it ripen to yellow for a starchy side dish or snack. Or let the peel turn black for a sweeter and softer dessert-like dish. 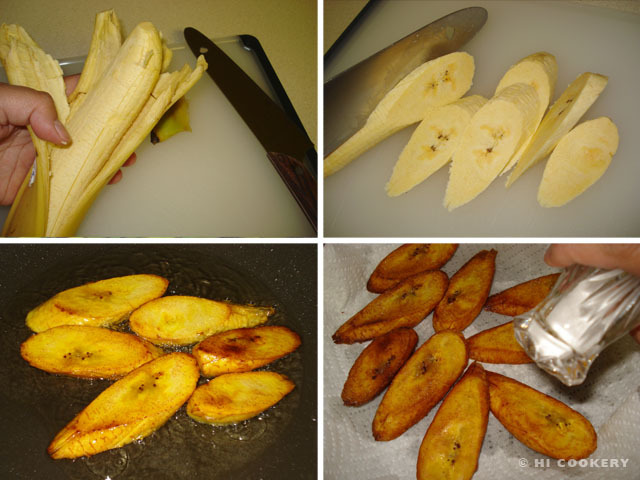 Cut off an end of the plantain, slit down the sides and peel it open. Cut diagonal slices. Heat the oil about ½ inch high in a skillet. Lower to medium heat and fry the slices slowly until they turn golden brown on each side. Drain on paper towels. Season the starchy-style plantain with salt or sprinkle a little sugar to caramelize the sweeter version. Serve hot. Plantains are a member of the banana family. Read more about the similarities and differences between bananas and plantains as well as get nutritional information about the latter from the Grab’Em Snacks site. Search our blog for other banana recipes.